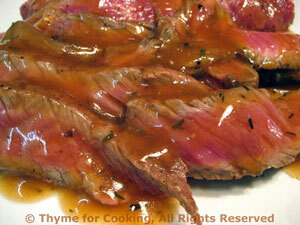 Grilled Sirloin Steak Madeira, Thyme for Cooking easy gourmet dinners. Three peak seasonal ingredients + 15 minutes cooking = perfect summer first course. Pour a chilled Rosé and relax. Drizzle with olive oil and Balsamic if you like... I didn't. I prefer the pure summer flavors! Fresh mozzarella comes in a round, ball shape, packed in liquid, usually in a bag. Save leftover cheese in the liquid, in a small bowl. Brush or spray 1 side of the zucchini with a bit of olive oil and place on a baking sheet, oiled side down. Bake, 400F (200C) for 10 minutes, just until the center of the slices starts to look soft and cooked. 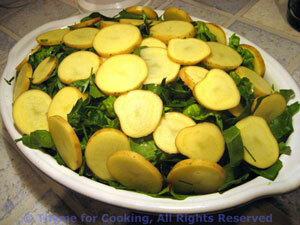 Remove from oven and lay the tomato slices on top. 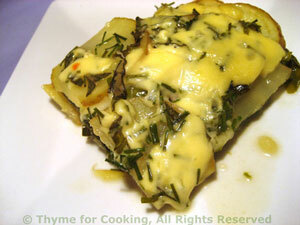 Remove, lay cheese slices on top. Return to oven until cheese melts, another 3 - 5 minutes. 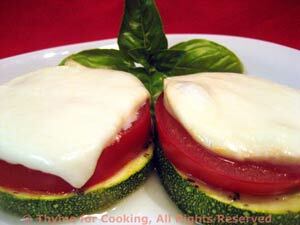 Remove, arrange two on each plate, garnish with basil and serve. Hint: If you don't have a brush, dip a corner of a paper towel in the oil to brush on.